Feeding a kitten is not as simple as you would think it is. Sure, you can simply open up a bag and scoop out some dry food into a bowl, but in order to support your kitten’s healthy development, you’ll need to be better informed. Why? Because within 6 months, your furry friend will reach 75% of their adult body mass. It’s critical that kittens are given the nutrition they need during this high growth period! Cats like their routine and habits, so try to start one as soon as you can. Feed your little one at the same place and time each day, and make sure they have a quiet area where they can feel protected and at home. Do not under any circumstances place their litter box near the feeding area, as that would be disruptive to their clean feeding environment. After all, no one would like to have dinner next to a toilet. Cats are the same. The feeding area must be easy to clean, and the same goes for the bowls you put food in. Some cats may prefer to eat from flat bowls, while others will prefer a saucer-styled one. Pay attention to your kittens feeding habits, and see what it prefers. Make necessary adjustments to better accommodate their preferences. As kittens have very sensitive digestive tracts, sticking to a routine also requires choosing the same brand of food. If you see a certain flavour or brand works best, keep using it, as you avoid the risk of upsetting your pet’s stomach. Dry foods are the go-to foods for kittens. They provide cats with more energy than wet foods, they are easy to measure, great for your kitten’s teeth (as it helps remove plaque), and it makes it easier for you to give your pet the right amount of food and nutrients. In addition, they are also very easy to store and durable. 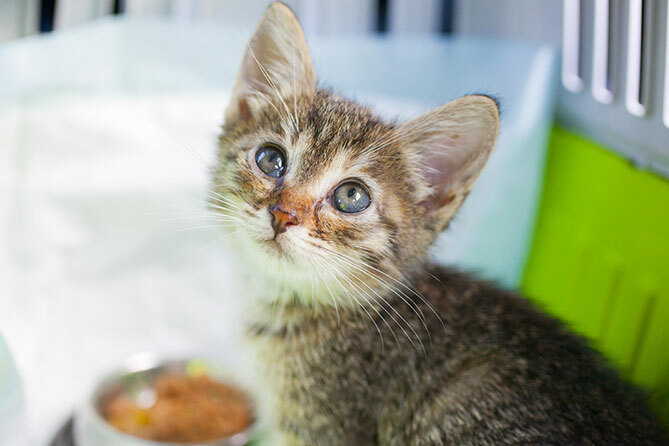 Some kittens might prefer wet foods, as the smell and texture can often be more appealing, especially when they’re younger and their teeth aren’t that strong. Wet foods have more water than dry foods and can assist in keeping your kitten hydrated. They are fresh, and easy to serve. However, a diet comprised solely of wet food might lack some important nutrients, and will not offer a chance for cats to put their teeths to use, so it is better to serve dry foods alongside these kinds of diets. It is always advisable to stick to food that has been designed especially for kittens and to consult with a vet before feeding your cat anything else. However, if you wish to feed your pet fresh food, there are a couple of things you need to have in mind. Try to avoid bones, as young kittens may have difficulty chewing them. Also, always choose to feed your cat raw bones, never cooked ones. You can also feed them with tinned tuna or sardines as an occasional treat, but not too often! Avoid processed meats such as sausages at all costs, as they contain lots of preservatives. Contrary to what some people still believe, kittens don’t need to drink milk after weaning (the process when they start to become independent and have their own food). Some kittens and older cats might even be intolerant to some of the sugars milk contains, so it is better to stick strictly to clean and fresh water. Keep a bowl of it next to their food bowl in their feeding area at all times. As your kittens grow fast, they might eat whatever you put on their plate. But limits are important, and it is in your hands not to overfeed your little one! Four meals a day is ideal for your pet. However, if you’re not always at home during the day, you can feed them three times and leave a small amount of dry food in their bowl for them to eat later on, if they feel hungry. When your kitten reaches six months of age, switch to two meals a day. Obesity in animals, especially in seniors, can be a huge health issue for cats, so be sure to monitor your cat’s condition.